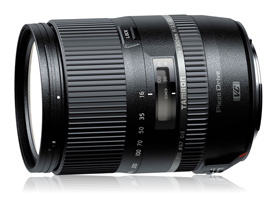 Launched just eight months after its announced development, the Tamron 16-300mm F/3.5-6.3. Di II VC PZD Macro is the most ambitious iteration of the maker’s super-zoom series to date. Not only does the reach extend to 300mm up from 270mm, but the wider end expands coverage from 18mm to 16mm, making it the equivalent of a 24-450mm in a package not much larger than some starter zooms. Features include stabilization (vibration compensation) on Canon– and Nikon-mount models, and a practically silent sonic-type AF motor with full-time manual override. Tamron claims a weather-resistant build, although it’s not clear if there are any internal seals. It also has close focusing to 39 cm, but with a maximum magnification of 0.39x, that’s somewhat short of a true macro (1.0x). The optical construction consists of 16 elements in total, arranged in 12 groups with four aspherical surfaces and two ED glass elements to reduce chromatic aberrations. The lens focuses to 15.3 inches (39 cm) and measures 2.95 x 3.92” (75 x 99.5 mm) and weighs 19 oz (539 g). It is available in Canon, Nikon and Sony mounts for around $629 (USD). 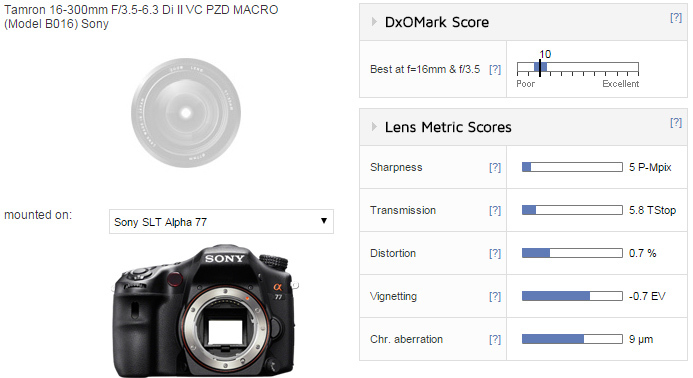 With a DxO Mark lens score of 10 points and a peak sharpness of 5P-Mpix, the Tamron achieves a fair score for the type of lens it is, but as such, it is understandably lower than a prime or high-grade zoom. Peak sharpness is in the f/4-5.6 range at 16mm, and it has excellent uniformity between 35-100mm with pretty good levels of sharpness. Between 200-300mm, however, sharpness is good centrally, but less so at the borders and corners of the frame. Barrel distortion can be high in zooms like this, and while it is quite high at 18mm, turning to pincushion at 24mm, at least it avoids the difficult-to-correct complex (mustache-type) distortion. Chromatic aberration is generally low, peaking at 9 microns, but at 300mm, it is noticeable in the periphery and especially so in the corners, otherwise it’s reasonably well-controlled. 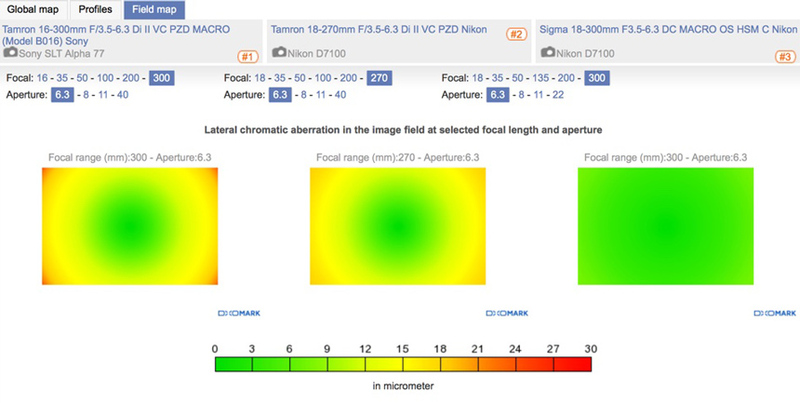 Illumination across the field is good, with a maximum of –0.7Ev measured in the extreme corners at 16mm, and transmission is good at the wider end, although T7.2 at 300mm will challenge most f/5.6-sensitive AF-sensors in low light. Although we have not reviewed the previous version for a Sony mount, we have tested the lens for a Nikon mount on the Nikon D7100, which has a similar sensor to that of the Sony SLT Alpha 77, and we’ve also tested the Sigma 18-300mm on the Nikon. 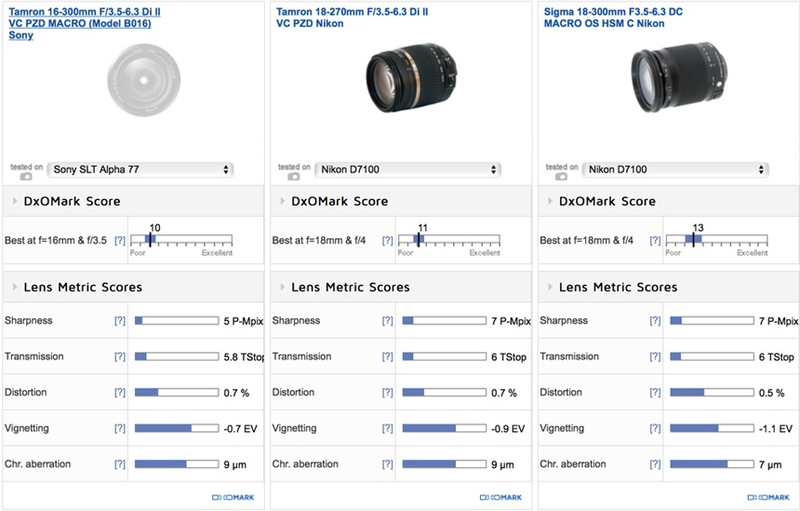 From the results, the new Tamron compares favorably with its predecessor, giving up a little in peak sharpness (mainly when stopped down) for the convenience of the wider range, while also improving on vignetting and transmission in the process. The new Tamron also fares reasonably well against the Sigma, although similarly, there’s some trade-off in performance for the convenience of that wider 16mm focal length. In terms of sharpness, for example, the Sigma is sharper over the 18-28mm range and is slightly sharper across the field at 300mm, and has far superior control of lateral chromatic aberration. 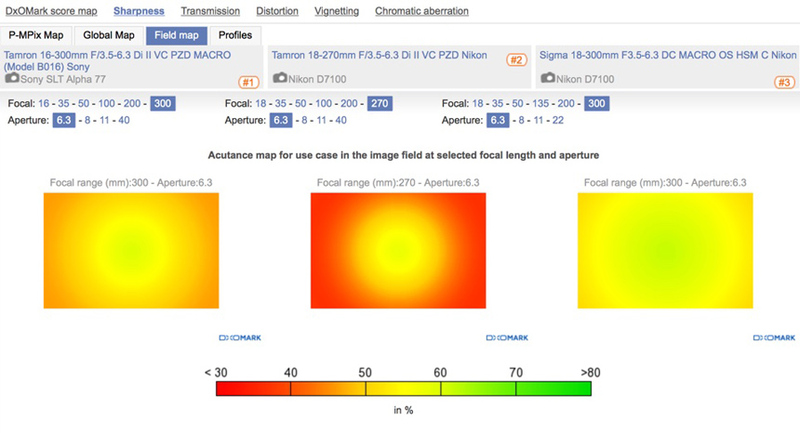 However, it has higher vignetting, particularly at shorter focal lengths. While the Tamron 16-300mm has generally good sharpness, the Sigma is sharper over the 18-30mm range, and perhaps more importantly, is sharper across the field wide-open at 300mm (shown above). The new Tamron has generally good control of CA; however, it is troublesome at 300mm, even though peak levels are considered to be low (peaking at 9 microns in the corners). The Sigma (right) has excellent CA suppression at 300mm. From our tests, the new Tamron has made some compromises over its predecessor, but there are also some worthwhile improvements. Sharpness levels and uniformity are greatly improved at and close to the maximum aperture where a slow lens like this is likely to be used. Peak sharpness has dropped slightly when stopped down, but this isn’t likely to be show-stopper, compared with the benefits and convenience of the increase in zoom range. However, while the new Tamron is very well-balanced optically, its performance at 300mm is compromised slightly by high levels of CA. Few lenses exist without rivals, and this shortcoming is highlighted particularly when compared with the Sigma 18-300mm, which is not only slightly cheaper but has the added benefit of being noticeably sharper at the shorter end. Be that as it may, the convenience of the wider Tamron is undisputed and it remains an attractive option for a lens like this.